You may not know this but a while back I started carving my "chop" and a small relevant Native American symbol on my prints. Tiny, very tiny, so as not to interfere with the design. Since most of my work is "dense" with many marks and especially many curvy marks, these have gone unnoticed. Someone who bought one of my prints noticed one and asked so I thought I would share with all. A "chop" is a special marking to identify prints produced in their studio or shop. 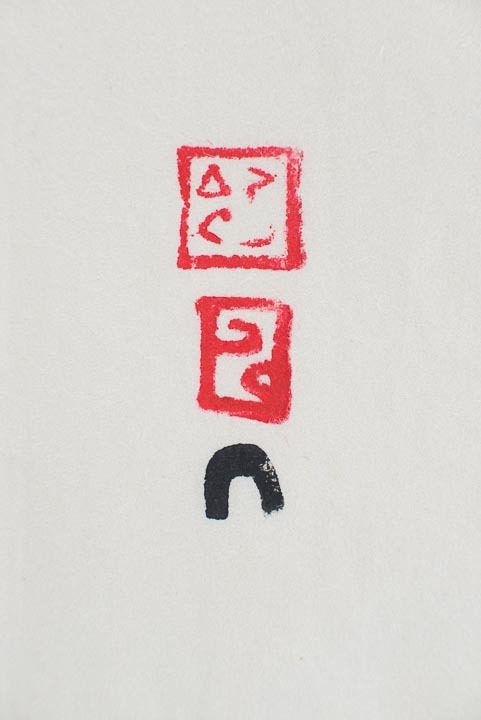 This marking is known as a “chop” and is either embossed or stamped somewhere on the print. Traditional Japanese woodblock prints, produced in large studios with many collaborators, often have several chops stamped on each print, one for the designer, one for the printer, and so on. Ever efficient and slightly dissonant with tradition, I usually carve my chop right on the block and let it print within the design. Because I don't want to disturb the compositions, the chops are tiny and often hidden within a whirlwind of my markings. One chop I use is a simple rounded M with an A underneath, completing a circular design. My initials. The other chop I often use is one of many Native American symbols. I have various books and cards full of them and have found many out on my hikes carved or painted in rocks around this area. Carved symbols or entire panels of Native art are called petroglyphs, many times the carvings are painted; sometimes erosion and nature's forces have changed the color of the carved portion against the surrounding rock. 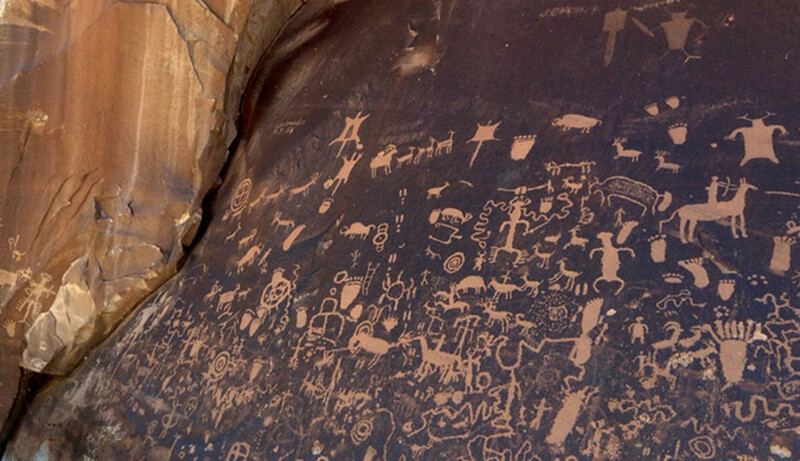 Painted panels are usually called pictographs and are a beauty to see, worn by the ages and telling of many stories of the ancient dwellers of the desert. Many panels have a combination of story telling and symbolism. Really fascinating stuff to learn. Here is my latest print highlighting the chop marks. The butterfly is Native symbol of everlasting life, the other chop is my initials MA in a circle. I add a different Native American symbol to my prints but always my initials. Corian is actually the name of a synthetic resin by Dupont that is used for kitchen counter-tops and other fixtures. Another use for Corian is as cutting boards. So once upon a time, I thought to use it as an engraving surface although I was not surely the first. Corian scraps are easily acquired through EBay and other online outlets, as well as any kitchen/bathroom counter manufacturer or kitchen remodeler in your area. If lucky, a kitchen depot place will let you rummage through their discards and you can get this marvel substance for free. Even when purchased online it is not very expensive, especially when compared with traditional end-grain wood engraving blocks, and especially for larger blocks. Amazingly, Corian is very easy to cut with a proper saw blade and will easily cut even by hand with a diamond or carbide blade. I prefer carbide blades on my jigsaw although for many cuts a circular saw or even table saw may be appropriate. The cuts are clean without chipping with a sharp blade and some patience, let the blade do the work rather than pushing it. Little is needed to get Corian ready to engrave. I like to give the surface a careful look because any tiny scratch will show on delicate prints. The surface can almost always use a bit of degreasing, like etching plates, because they come with a slightly waxy feel so that they will repel substances in kitchen use. I usually degrease with kitchen detergent and a soft plastic bristle brush. Then it will accept a drawing or transfer. Cleaning the blocks is very easy, I clean by printing and they give up the ink so easily that very little else is needed. I usually wipe with a dry shop towel and sometimes give it a last cleaning with alcohol. I have successfully transferred inkjet drawings onto the surface with various methods, my favorite is "Studio Paper" from McClain's (imcclains.com). Unfortunately, most Corian scraps are colored to resemble granite or other surfaces and sometimes heavily so. The upshot is that a generous going-over with magic marker is almost always necessary. The drawing with marker will eventually wear off after a few proofings and cleanings so be aware of that. Advantage of drawing with marker is that the blocks don't need hardly any preparation at all. Just reverse your reference drawing and copy onto block. The main advantage of Corian is the amazing detail that is possible. I engrave mostly with standard wood engraving tools and only need to hone them slightly during work. Perhaps the biggest advantage of Corian is that it will accept limitless rotary tool marks without chipping, breaking down or disintegrating as sometimes wood and Resingrave are prone to do. 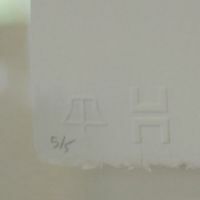 The tiniest details are possible so Corian has become my favorite surface for smaller works. A vast landscape on a tiny block has a wonderful miniature masterpiece feel to it. Don't forget to get good magnifying equipment and good light. I use a combination magnifier/lamp which makes working detail very easy. Printing is much easier than with wood as there is no absorbance of ink into the block. Very little ink is needed and spread very well but in a thin layer. When Corian meets paper nearly all the ink gets transferred with not so much pressure so printing smaller works by hand is fast work. I'm into detail nowadays, makes me disciplined and I enjoy the magic of bringing something out of nothing with tiny little marks...LOTS of tiny little marks. Corian is perfect for that. Since Corian scraps are often colored and sometimes heavily so, I have been using spray gesso (which BTW auto-correct wants to change to "gestapo" LOL). A nice thin layer of gesso and my drawings or transfers go on perfectly. Unfortunately as I engrave, the dark color of the Corian slab comes through but under the magnifying lamp, I can see all the lines like little canyons in the desert. This particular block is a medium gray so once I inked and cleaned up, the elements show up nicely. Print proof 3, getting there! I was going to call this piece "promised land" but being a realist I understand there is no such thing in life. All we have is our respective journeys and our feet. Once the walk begins, there is no place that is too far to walk if we just have the stubborn inclination to keep walking. The light guides us, surrounded aloft and afoot by prickly, sharp, hard and biting things, we bear all, we move onward to the destination, distant yet attainable and somehow irrelevant. Walking the journey is life, one step at a time. 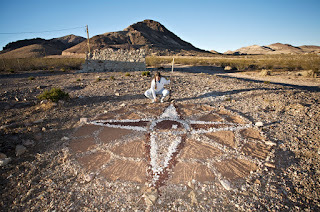 "Not too far to walk" is a a song by John Huling, largely unknown master flutist who publishes most inspiring native nature revering Southwest music.